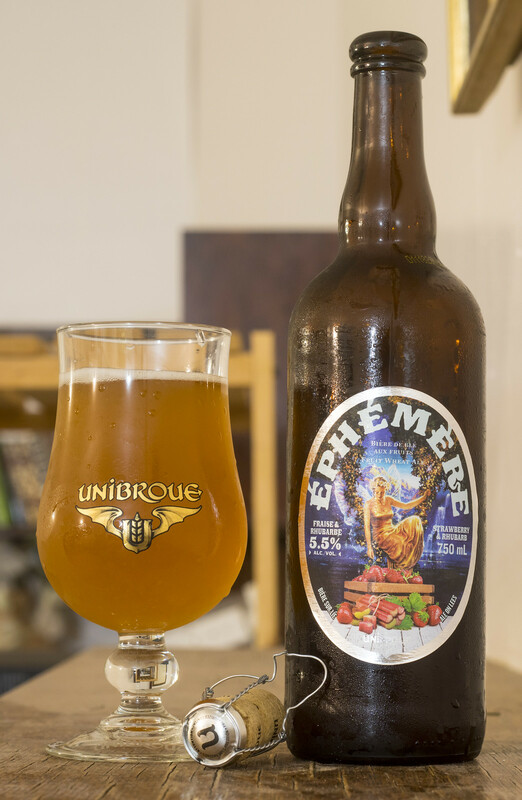 Another day, another new Unibroue Éphémère beer! This time around, it's a Strawberry & Rhubarb fruit beer, which I think will actually work really well with the Éphémère line. We're seeing rhubarb starting to take off in Belgian-style beers, so a combo of that and strawberry could possibly work. I miss their Framboise (Raspberry) beer, that one was great for beating the heat.. but I feel like this one could be possibly one of their best beers of the Éphémère line of beers yet.. even though I find that most of them are not worth their price. Éphémère Fraise & Rhubarbe tops out at 5.5% ABV and 11 IBUs. Appearance: Hefty, cloudy orange-body ale with a liberal amount of carbonation in the body of the beer. The head is an off-white beige that starts out pretty thick but quickly diminishes to leave behind just a slim amount of foam that's mostly near the rim of the glass. Aroma: Very aromatic with a heavy dose of strawberries.. like a lot of strawberries, but thankfully reminiscent of fresh strawberry purée instead of a strawberry extract. Already, this beer is bringing me back memories of various strawberry beers I've had in the past few months like The Last Strawberry by BC's Fuggles & Warlock. It's been a long time since I've had something with rhubarb in it as I was never a fan.. so there's a hint of a vegetal yet incredibly sweetness that compliments the strawberries. My mind is kind of thinking that this is a Frappuccino.. when it's obviously not. Taste: The taste of strawberries pops out big time in this beer, but I'm also getting a light tartness and a light amount of vegetal presence to it. This is definitely quite sugary and sweeter than I expected from Unibroue compared to the typical Éphémères, but this one reminds me of homemade strawberry jam as it's being cooked in the pot (memory from my grandmère's place in the '90s). It's got a decent amount of yeastiness mixed with wheat malt that gives off a mild biscuit presence to it. I felt like there was a hint of coriander in there, but I didn't really notice it after a while. Moderately dry mouthfeel and the aftertaste is a mild vegetal, cucumber-like taste with a sugary strawberry presence to it. Overall Thoughts: The Fraise & Rhubarbe version of Éphémère is probably one of the better versions they've had yet. It works well for the heat.. it's sweet, incredibly fruity and a bit vegetal but it may be a bit too sweet for a lot of people as it's almost as sweet as strawberry jam. It immediately reminded me of their Framboise when I opened the bottle.. so it really took me back, but I wish Unibroue would work on replicating Belgian-styles more, or even experiment with wild yeasts. I'd love to see a wild yeast version of La Fin du Monde. If you're reading this Sleeman Unibroue, do it.. and send me a sample!